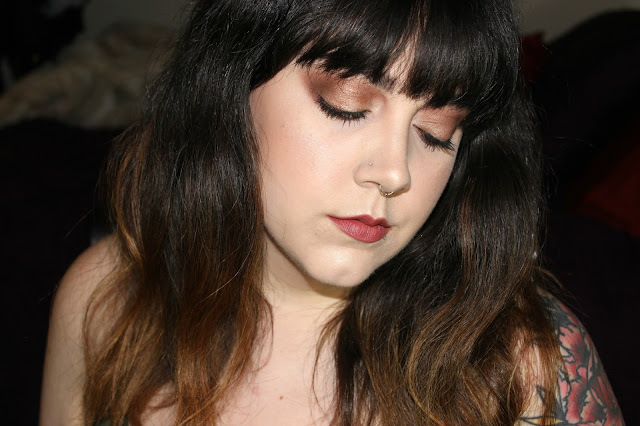 Lipstick Is A Life: Thanksgiving FOTD! coming together and giving thanks for our freedom, way of life and each other. There are bound to be photos taken, playing games, tossing a football or carving the bird. I wanted to create a look that would photograph well yet not look overdone. So grab your favorite sweater and a cup of hot cider, it's time to give thanks. I always want to remind you if you don't have all or any of these product, use what you have. You don't need exactly the same products to create this look. 2) Then with my concealer, which is about 2 shades lighter than my skin, I highlighted my face and blended that out with the same Beauty Blender and then dipped the damp sponge into my loose setting powder and dusted it under the eye to prevent creasing. 3) I then shaded in my brows with Dipbrow and combed through them with clear brow gel. 4) I, for some reason, wanted to build this look around the lower lash line and waterline being penciled in with a rich chocolate brown so I did that step after priming my lids. 6) Going a little lower I took Nooner right over Limit focusing more on the socket. 7) Taking Strange on a different blending brush I blended out the edges and on a pencil brush popped a bit in the inner corner for a matte highlight. 8) On a flat brush I put Liar on the inner 2/3 on the mobile lid to open up my eyes. 9) Next, on a duo-fiber blending brush I took Blackheart and worked it in a C shape and up into the crease keeping the eye look rounded, putting extra focus on the outer V while keeping it rounded. 10) Taking Blackheart on a pencil brush I smoked out the bottom lashline over the Kajal liner to soften it and add a little depth to the outer V.
11) Using a very fine angled brush I took Darkside smudged into the upper lash line. I chose to use a softer shade than black to just add a little fullness without creating a visible line. 12) Then I used my favorite mascara for full, thick, defined lashes, because I didn't want to wear falsies. 13) I used the lightest contour shade in the contour palette and used it in the hollows of my cheeks and jaw line. 14) As with all of these steps you can pick and choose what you want to do, but I wanted a very defined nose. 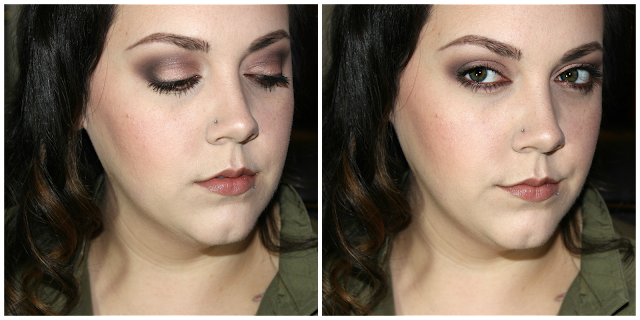 I contoured the side and tip of my nose with the lightest shade as well on a fluffy eye brush. 15) Then taking a light bronzer I went over my contour and around my forehead. I like to warm up these parts of my contour when wearing a smokey eye. 16) On an angled blush brush I took a neon pink blush lightly on my cheeks and then went over it with the shimmer brick for glowing cheeks. 17) I then highlighted my cheek bones and popped a bit on the apples of my cheeks. I also highlighted the tip of my nose and chin. 18) Then I sprayed my face with a hydrating setting spray to help the powders used look less dusty and blend together. Top the look off with a gloss and you're done. That's the look finished. I wanted to keep the lip simple since there will be eating and drink going on, along with loads of chatting so a bold lip can be a bit of a fuss, this is Thanksgiving after all. This look is very warm and soft while still being defined, perfect for a fun day. just in time for you to be exiting your food coma. Happy Thanksgiving! !